Self-service coin counting machines: Does it make sense to rent or buy? For financial institutions, enhancing the customer experience is more important than ever. The industry itself is changing, and it means doing more with less, while focusing squarely on serving the customer. That's because customers have more choices than ever before, from traditional banks to online banks to using banks for only the bare minimum — a checking and savings account — and using fintech solutions for the rest of their financial needs. It's necessary for financial institutions to give their customers something they can't get from an online fintech startup, namely the customer experience in the branch itself. One way to do that is with a coin-counting machine. The average person who saves coins counts on their financial institution as the place to cash in those coins. In the past, this has been the teller's job, but now, it's necessary to maximize tellers' time for other customer service tasks. 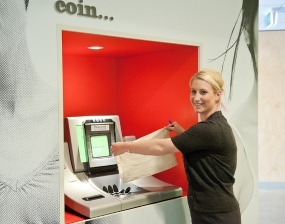 Enter self-service coin counter machines, which let customers perform this service themselves. Yet, not all FIs can or want to purchase coin counting machines. With the right company, you have more options to choose from so you can easily add this valued service to your branch. But, does it make more sense to buy, rent or lease the machine? Here are a few guidelines to get you started. Buy: It makes sense to buy a coin counting machine if you want to maximize long-term profitability and return on investment through self-service coin machine ownership. Rent: It makes sense to rent if you want to keep your lines of credit and retain capital so you can generate earnings while maximizing profits. Lease: It makes sense to lease if you want to count on a fixed monthly payment for one to five years. With this option, you set up the user fee and the profit is yours to keep. Whatever option is right for your branch — buying, renting or leasing — the important thing is the enhanced customer service a coin-counting machine can bring to your branch. It will keep those customers coming to you for a variety of financial needs, which is more important than ever in banking today.